Regardless of whether you’re a day hiker or a thru-hiker, finding the right gear is imperative to a successful, and fun hike. 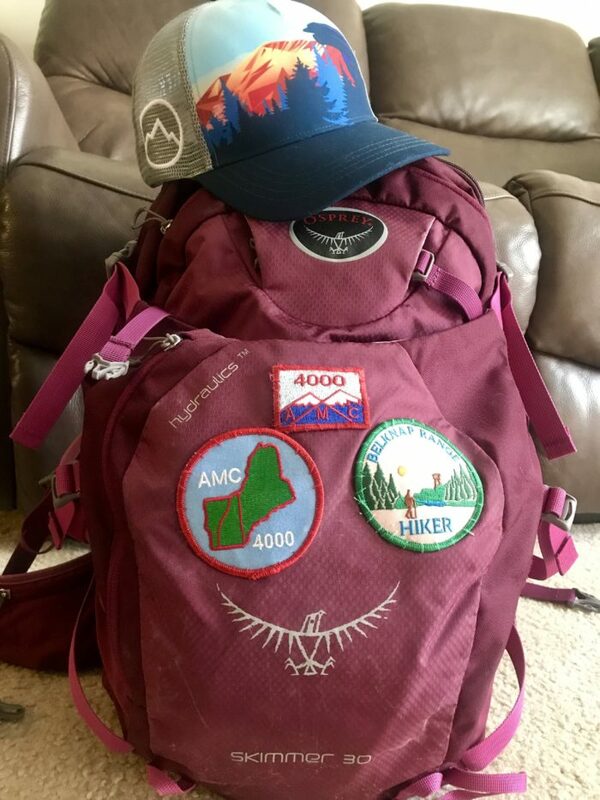 Over the past three years hiking solo I’ve learned a lot about gear and what to carry as a day hiker. When I look back at what I carried on some of my first hikes it’s amazing how much stuff I had that I didn’t need. Most importantly, I’ve learned that there are simple things you can do to eliminate extra weight while not compromising safety. 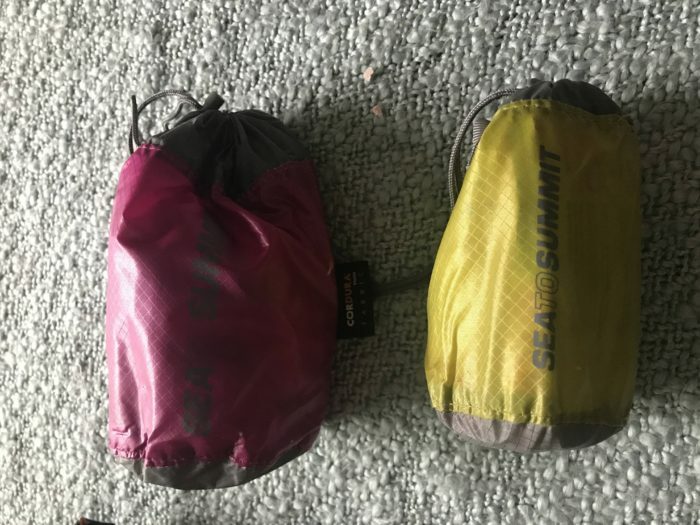 In this post, I’m going to talk about what gear I carry as a day hiker. I swap out some gear depending on the season, but the majority remains the same. This post contains my personal preferences and what works for me as a hiker. I am not a professional nor do I think that what works for me will work for everyone. The majority of my hikes are what I consider full-day (meaning, they last at minimum six hours) although in winter and shoulder season the length runs shorter. 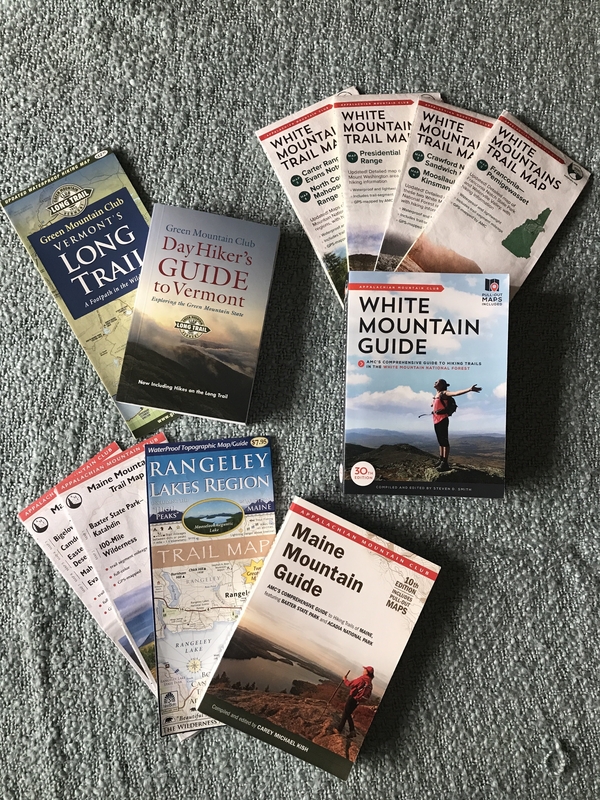 I tend to prefer peakbagging to hitting a single peak and my motto is, “the more miles, the better.” If a hike runs under ten miles, it tends to feel too short. I don’t stop for long on hikes, (especially in winter) but I’m not a trail runner. I average two mph over the course of a single day of hiking, even in winter. Regardless of what season I’m hiking in or how long the hike is, I carry almost all the same gear. It has taken a few years and quite a lot of research to dial in what I need to carry, but I’m finally content with what’s in my pack. When looking at all the day hikers out there, I categorize them into three types: ultralight/trail runners, midweight, and heavy pack hikers. I fall in the midweight category and I would argue that the majority of day hikers fall in this category too. Ultralight/trail runners carry the bare necessities on their hikes. They are usually very experienced and have chosen to take greater risks by carrying less safety gear in order to go faster. Their packs usually look very small (sometimes they will only wear a water bladder pack) and they carry only food, water, and maybe a few other small essentials. Heavy pack hikers are usually carrying everything they could ever need on a hike. They trade speed for safety and would rather be prepared for the unexpected than go fast. Some will even carry a sleeping bag or bivy sack. Their sleeping pad is usually seen strapped to the outside of their pack and their pack will contain everything they may need if they find themselves having to spend a night in the woods. Midweight hikers carry everything they need for the day (food, water) and a little extra in the event that there is an emergency. 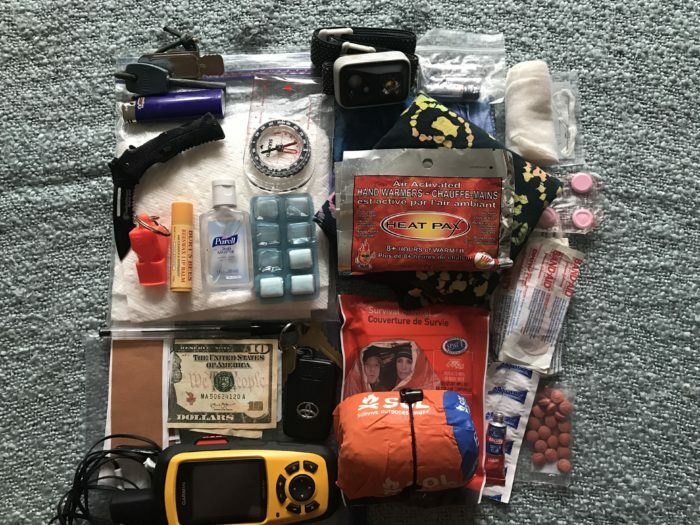 Most hikers fall into this category and although most midweight hikers don’t carry overnight gear for a comfortable night in the woods, they usually carry some basic emergency gear. There is nothing worse than getting hurt or lost in the woods and needing to be rescued. Unfortunately, there are going to be accidents and even if you’re prepared and experienced, you may find yourself in need of rescue. To require rescue means that you are in a life-or-death situation (not simply tired). It isn’t a quick fix and you should plan on spending at least three hours in the woods waiting for rescue. Keeping all of that in mind, there are things you can carry in your pack to ward off pointless calls to search and rescue. I also recommend taking a first aid and navigation course so that you’re prepared in the event that you get hurt or lost. New Hampshire has a program run through Fish and Game known as Hike Safe. 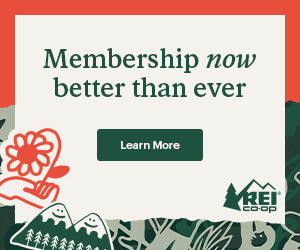 Purchasing the card will cost you $25 (alternately, buying a fishing/hunting license counts as your Hike Safe card) and in the event that you need to be rescued, you may not be charged a hefty fee. Note that just buying the card isn’t a proverbial “get out of jail free” card. There will be an investigation into whether or not you were carrying the ten essential pieces of gear, and if your rescue was a result of gross negligence. As a midweight day hiker, I carry a Skimmer 30 by Osprey year round. My base weight in summer runs seven pounds without food or water and my winter base weight runs 7.4 pounds (not included in calculating my base weight: trekking poles, worn clothes, and Microspikes). Carrying the right gear in your pack is just as important as finding one that fits you correctly. Having your pack sized at most local outfitters is essential, in my opinion. After carrying the wrong size pack for eight months, I ended up developing a cyst on my spine, which landed me with some severe medical issues. All of these items fit in a few small stuff sacks or hip-belt pockets on my pack. On top of the gear I carry for emergencies, plus clothes, food, and water, there are some extra items in my pack. Every ounce counts when hiking, even if it’s only on a day hike, and I don’t carry things I don’t think I will need. There are some items, though, that I have used time and time again and although they’re not items I would consider part of my first-aid kit, they’re items I’ve decided are necessary on every hike. Garmin Fenix 3HR (I am obsessed with this watch even if it’s bulky and not fashionable; I wear it every day). Although it can be overwhelming when you start researching all of the gear options and lists of what people carry on hikes, keep in mind that everyone starts somewhere. You won’t become a pro in a day, and you won’t know what works for you until you get out there and test out gear. Don’t be afraid to ask questions and always remember that you are your first line of defense against needing to be rescued. Don’t let fear of failure, the unknown, or not being good enough stop you from getting out there and experiencing the insurmountable beauty that the woods have to offer. Love the article!! I carry mostly the same stuff. I am on a Search and Rescue Team and even though I try to lighten my load. I can’t help but think what if? And Ill be dammed and if I have to call in my own rescue because I wanted to save on weight.